Goldberg & Rosen, P.A knows how to Walk Like MADD. 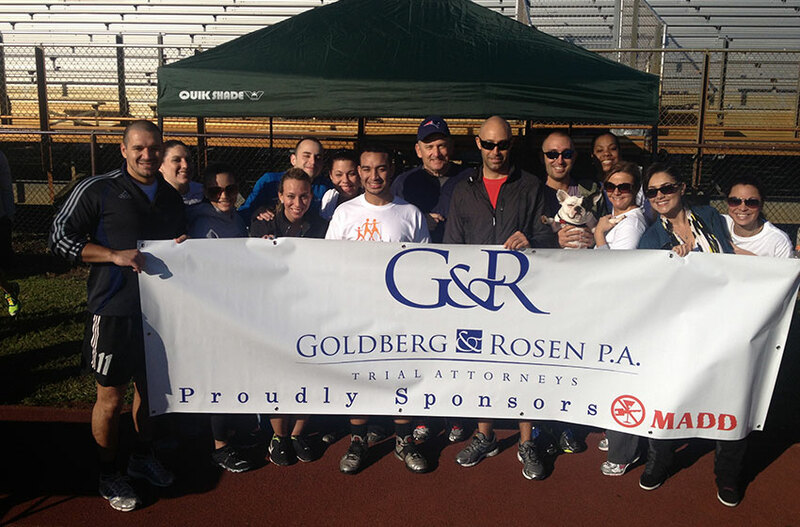 Recently the attorneys and staff at Goldberg & Rosen, P.A sponsored and participated in the Walk Like MADD event. This is the third consecutive year that the firm has been involved in the program and has previously sponsored events for Mothers Against Drunk Driving at our office. The walk was a tremendous fundraiser to bring attention to the dangers of drunk driving, as well as the MADD foundation has been serving our community and making our streets safer for 32 years. Not only was it a positive event for the community, but it was a ton of fun for the firm and our friends. The race was supposed to be a walk, but most of the staff took the opportunity to practice their running skills and needless to say, the photo finish was quite exciting.